Composed of a parklet, flower beds, bump-outs, an Eat for Equity block dinner party, and more social spaces for kids and adults alike, the summer-fall 2017 29th Street Shared Street demonstration implemented promising improvements that could inspire more community-led changes along 29th Street. Led by partner the Midtown Greenway Coalition, the shared street reflects the Partnership's community plans dating back to its 1999 Midtown Greenway Lake Street Corridor Framework Plan. That plan recognized the opportunity for 29th Street to serve as a premier promenade neighboring the Greenway. This summer and fall saw a glimpse of what that could look like when, with the support and leadership of local decision-makers, one section of 29th Street was temporarily transformed. Planning began in June for the 29th Street Shared Street demonstration. Project elements were implemented beginning in August, and the installation formally ended on October 15. The project covered three blocks of E 29th Street adjacent to the Midtown Greenway, creating a shared space for cars, bikes, and pedestrians. The project was made possible through a grant from the Center for Prevention at Blue Cross Blue Shield (BCBS) to vitalize active, healthy communities through temporary demonstrations. Over the course of June and July, three community meetings, including Spanish- and Somali-speaking meetings, engaged community members around discussions of what long-term changes community members would like to see on E 29th Street. Suggestions included a walking promenade along the Greenway, flowers, murals, and places for kids to play. 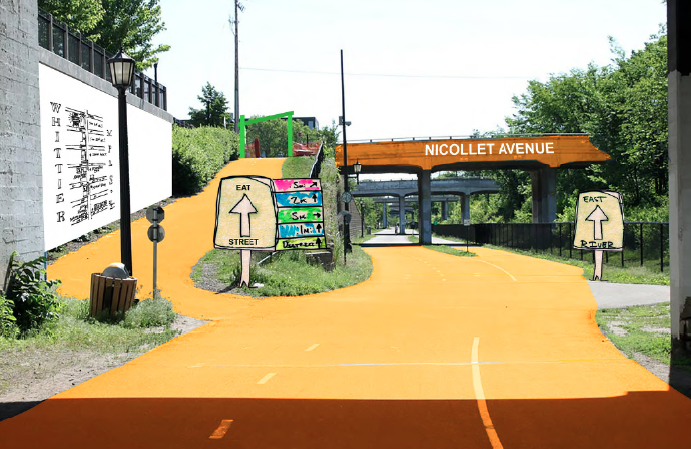 These ideas will be shared in the recommendations to the City of Minneapolis and Hennepin County that the Midtown Greenway Coalition develops. In early August, a picnic table built by a Midtown Greenway Coalition board member was installed in the parklet implemented as part of the shared street project. Former Midtown Greenway Coalition employee Mahamed Cali expressed his gratitude for the parklet and picnic table on behalf of the Somali community. Cali pointed out that the Somali community loves to sit outside but that community members do not always have appropriate outdoor spaces available near their homes. The shared street elements, including the parklet and picnic table, offered social spaces for the community. In early September, pedestrian bumps-out (also known as curb extensions) and a street meander with orange bollards were installed. Bump-outs extend sidewalks into the parking lane, slowing traffic, reducing pedestrian crossing distances, and improving the ability for pedestrians to see oncoming motorists and vice versa. ﻿The street meander involved temporary bollards used to move traffic on a meandering path and encourage drivers to use more caution and slow down. A test barrier was installed as a temporary safety improvement for cyclists exiting the Greenway from the 18th Avenue ramp. During this time, the City of Minneapolis placed “Call 311 to Comment” signs, and the Midtown Greenway Coalition placed wayfinding signs that employed a design by a local artist. On Saturday, September 9th, the Midtown Greenway Coalition partnered with the Semilla Center for Healing and the Arts to create two flower planters for the parklet at East 29th Street and Bloomington Avenue. Several community members, project steering committee members, and individuals from the Semilla Center for Healing and the Arts came together at the planter event. Representatives from the Semilla Center taught others how to create mosaics. The children helped crack the ceramic for the mosaic and encouraged everyone to try their hand. At the end of the event, two beautiful mosaics were created, depicting scenes of people biking through a neighborhood. Toward the end of the implementation of the shared street demonstration elements, over 300 community members came together for a block party and dinner on Saturday, September 23rd on E 29th Street between Bloomington Avenue and 16th Avenue. The event was sponsored by the Midtown Greenway Coalition and included art activities, chess, table tennis, basketball, free Thai rolled ice cream from Loulou Sweet & Savory, the installation of flower beds, and dinner on the street catered by Eat for Equity. Kids and adults carved and painted signs depicting what they would like to see on E 29th Street, such as butterfly gardens and more gathering places. Through feedback collected via the 311 hotline and a survey sent to neighbors, the steering committee learned what demonstration project elements worked well and what elements created challenges. The bollards and curb bump outs resulted in some complaints about car navigation difficulties due to bollards, but other community members indicated their appreciation for the traffic-calming measures. Neighbors enjoyed the parklet and the basketball hoop donated to the community. Several commented that the shared street elements made the route between the 18th Street Greenway exit and the 17th Avenue bike boulevard easier. Others commented that cleaning up the area and holding events in the shared street spaces helped limit crime. Neighbors were thrilled with the block party and would welcome the event again next year. Several community members remarked that they would like to see some of the shared street demonstration elements made permanent. With its conclusion on October 15th, the 29th Street Shared Street Demonstration was a successful, meaningful part of the East Phillips neighborhood over the summer and into the fall. The Midtown Greenway Coalition is interested in working with the City of Minneapolis, Hennepin County, and elected officials to consider permanent and more extensive changes along E 29th Street between Cedar Avenue and the Midtown Global Market.